Wanna know more about Ships and Nautical Leveling? First, Nautical Level is your Ship Character Level. You gain Nautical Levels by earning Ship XP. Nautical Levels is completely separate from your Character Levels and only deals with your Ship. And vice versa, your Pirate Character Levels only deals with Land monsters. 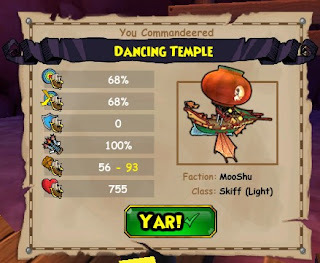 The higher your Nautical Level is, the stronger you get against Enemy Ships. 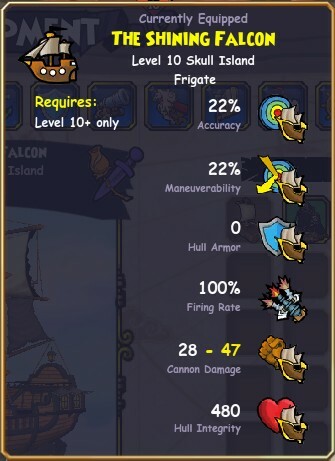 To know your Nautical Level, just press C, then look at the bottom of your Character. Yep that's your Nautical Level. I'm a Bilge Rat, ARRRRGH! Nautical XP will be in blue. What are Nautical XP for? Well, you need them to level up your Nautical Level and make your ship stronger too! Wait, why are Nautical Levels so important? but when buying ship parts, you sure do! What? You're confused? Just hold on. Let me explain this from the beginning. So your first ship was a raft right? 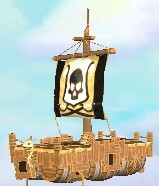 Then after a short while, you get the following ship from a quest. 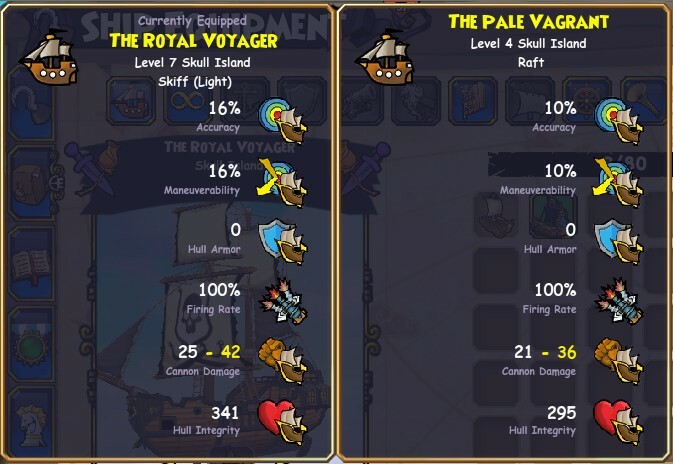 So now, look at both ships' stats. Yep the bigger ship offers better stats. 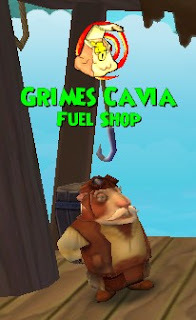 Now, you might have noticed Ship Parts Vendors such as this one. You might think Ship Parts, ehhhh. No no, Ship Parts help a LOT believe me. First let me explain about Ship Parts Vendors. Now there're general ship parts vendors or specific ship vendors. so watch carefully. Each world only gives ships or ship parts for its Faction. Valencia has Valencia, so on & so on. 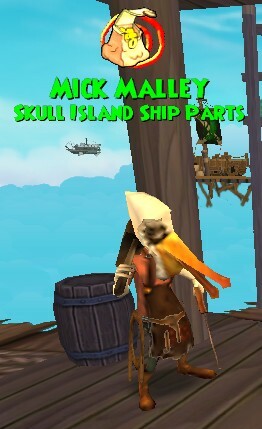 Be advised though that Marleybone ships can be found in Port Royal of Skull Island world. You will go to Port Royal after you complete 3/4 of Cool Ranch. We have not found any Valencia ships of yet even though there's a Concept Art of one. Factions is also known as kinds or types. 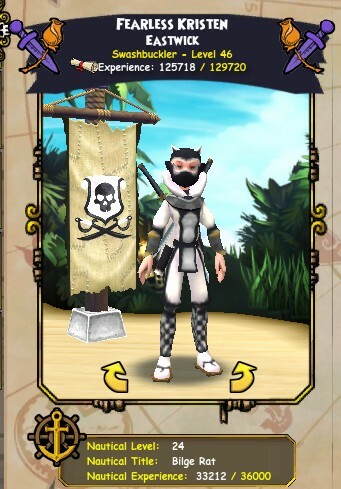 Skull Island, Marleybone, Bison, Mooshu. 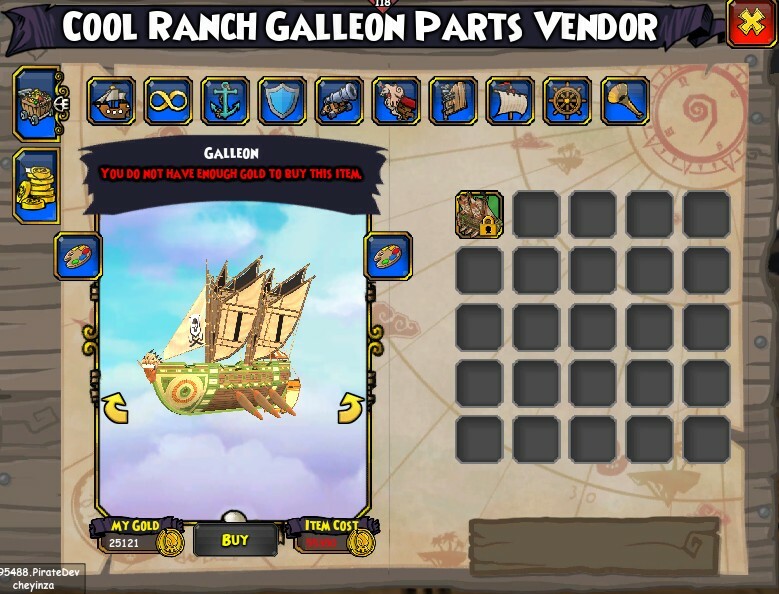 But then there are ship classes such as Raft, Skiff, Frigate, Galleon. by the Faction and Class to be able to find the right ship parts for them. You can't fit Mooshu parts on a Bison ship. Now you must've noticed the Nautical Level requirements. Ding ding ding! That's why you should nautical level up. 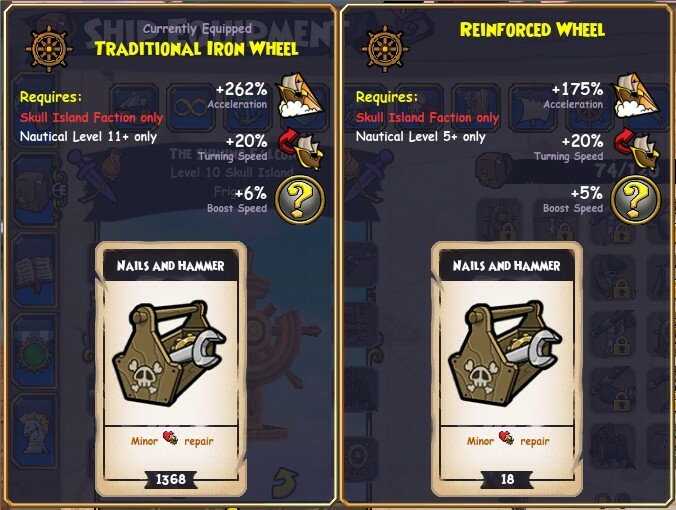 Are Ship Parts really necessary? Yes, let me explain why. 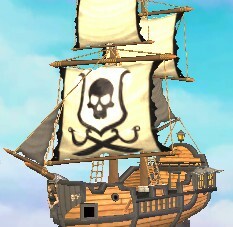 While sailing, you must've noticed those icons on the bottom of the blue globe that's for your ship. Each button will hold a card, Projectile Weapon card, Ship Spell card, Healing card and Speed card. 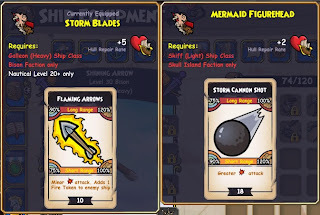 To earn cards for those buttons - the following Ship Parts has the Cards that you need. 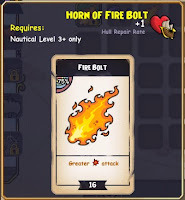 First card button, Attack Damage - The Figurehead will give you the Cannon/Arrows weapon card. 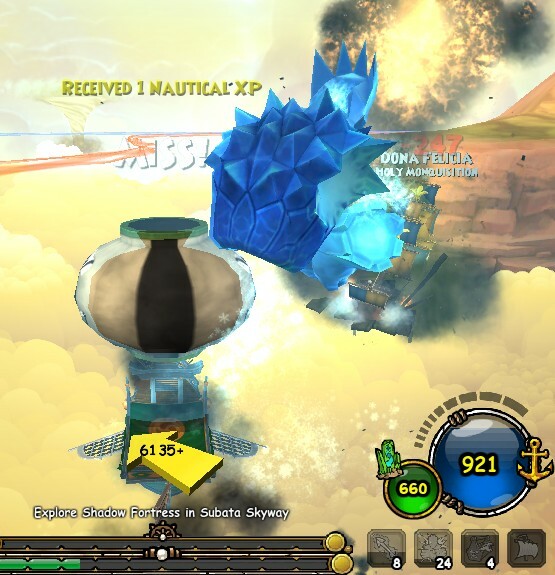 Cannons and Figureheads will boost the Attack Damage. 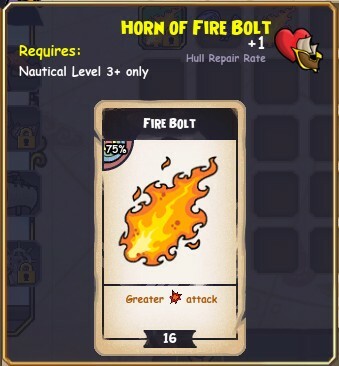 Second card button, Ship Spell - The Horn will give you a Ship Spell card. Third card button, Healing - The Wheel will give you a Healing card. 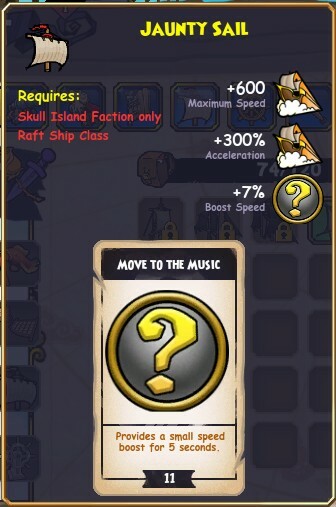 will boost the Healing Rate for your ship. And the last card button, Speed - The Sails will give you a Speed card. Sails, Wheels and Rudder will boost the Ship's Speed. which is pretty much like temporary powerful surge of speed. This is very useful if you find yourself in a battle or something you need to get to quickly. There are Fuel Vendors everywhere, but it's pricey to refill. So be wise about this. Also you will notice on some ship parts, they do boost the Fuel as well! Figureheads give you different kinds of arrows or cannon shots. 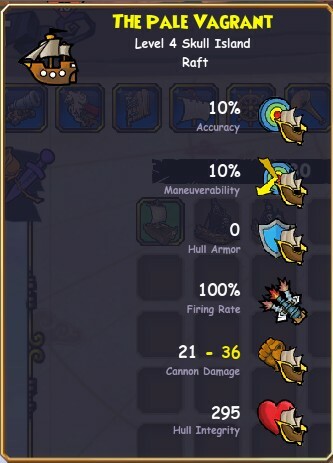 So figureheads gives you the weapon for the cannons. But you can't exactly shoot the arrows with your own hands. That's why you need Cannons. So the Cannons are the ones that gives the POWER behind the arrows. you still can attack, just not as powerful though. If it was the opposite, you will not be able to attack ships. You can't exactly throw Cannons at ships. 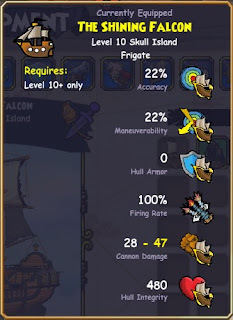 Again, notice the Nautical Level Requirements? Yep, it's important to nautical level up! Otherwise you can't equip them. If you have both, then you have amazing shooting power. They of course work best when they are together. Arrows plus Cannons. Makes sense to you now? Sure hope so! Yep you heard me. Ships can have cool attacking spells! This one is a Frost Giant. Errm, yea he's hitting me.. He's a powerful guy. You definitely don't wanna mess with him. Yea you're all excited now? LOL. Thought that'll help getting you into the ship fighting mood. Okay, Horns give you special Ship Attack Spells. 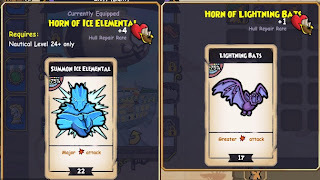 Yep there's a Fire Bolt, Lightning Bat, even Ice Elemental. Medusa, Judgement, some weird Death Spectre and a monster I cannot even describe LOL! that you will need in order to heal your ship while in battle. This is a VERY good thing. Hull Repair Rate will boost the healing you got for your ship. If you got all three equipped with the best Hull Repair Rate, the better! This is a no brainer. Sails means Speed. 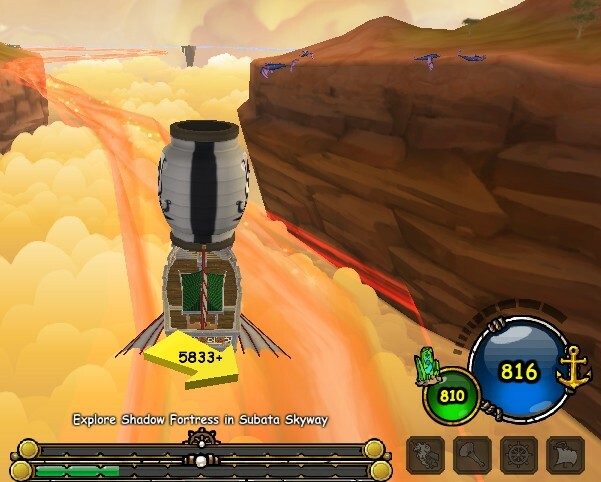 But then, Wheels and Rudder gives Speed boosts too! All three equipped, the faster, the better. Oh yes speed does count when travelling or fleeing from an attacking ship. 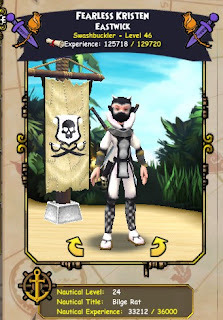 But remember you do have the option of different looks when buying sails. Notice the sails on left has a LOT of requirements. But gosh it's so much better than the right. 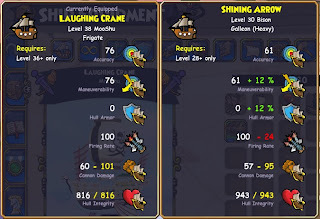 Again, that's why Nautical Levelling is important. and you can use it as often as you want to in-between cooltime. Yep there's cool time for all of the buttons. But, at least it also won't cost you a gold penny or errm crown cent? So those sails make your ship naturally faster and gives you a bonus speed card? 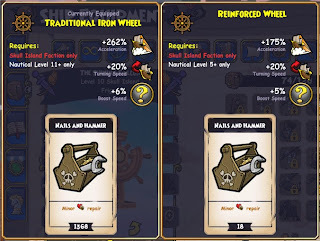 Now you want those Ship Parts, but how do you level up? and they fall apart and sink to the below. because I was way too high and they were too weak. You get more XP if you fight higher ships than you. Also notice the cool down timers on the buttons? Now you got all of the parts? Look what happens with your ship. The -24 Firing Rate is because I had no Cannons equipped. than a higher level ship with NO parts. Remember that. Accuracy means being accurate with your attacks. The better accuracy, the less misses. Maneuverability means being able to move your ship around. The better rate you get, the more nimble your ship can move. Hull Armor - The hull protection for your ship. Remember, the heavier armor you get, the stronger you get BUT slower movement. 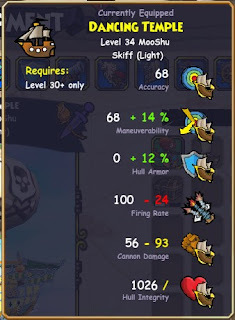 After all, the ship can't carry heavy armor and still be fast. Firing Rate means Shooting Rate, the faster you load it in, the faster you hit. Cannon Damage - This says it all. So how to find out what level the ships are? Just click on the enemy ship and you can see their info on the top of the screen. The number in the red circle is their level. The blue bar is their health, Yellow means halfway and Red means critical low health. 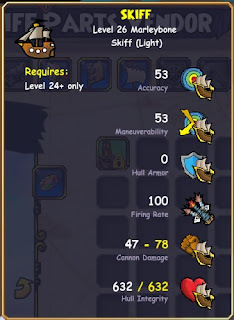 I am currently Nautical Level 24 and look at this picture. The enemy ships were 47. WHEWWWW! TOUGH! 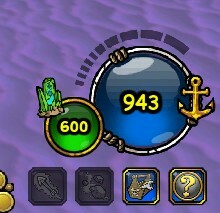 But look at how much Nautical XP I got! What if you try fighting ships and you die so often that you feel that they are way too hard? Wait, there's ANOTHER way of earning Nautical XP. You first have to attack them with anything you got, then let them board you. When your health dips low and becomes yellow, that means you can be boarded. If you really rather do Ship Fighting, remember you can do it with a friend! I have teamed up with other people and we fought ships which was very handy. This helped us level up very quickly especially when battles can take so long to finish sometimes. What if you want to buy the ship and just go sailing without the parts? Why? Lets look at my Treasure Chest ship. I call it that because it's ship icon is a Treasure Chest lol. Yes I swear its true. Anyway, this ship has NO parts equipped. 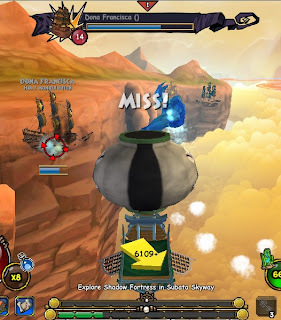 So do you notice the buttons below the ship globe? Yep, all greyed out. Not good. This means you can't attack, heal & speed. Not exactly fun really, right? and the last - the sails. Those will make the buttons light up. The rest of the Ship Parts will boost them up. 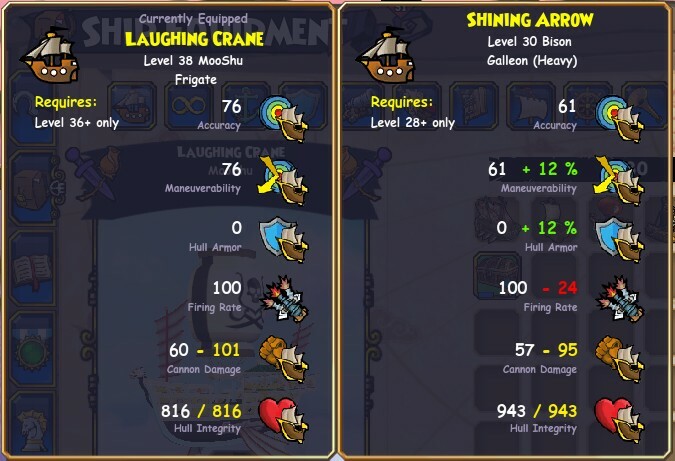 So if you want to equip great ship parts, nautical leveling is important. that can kill you quite fast. This way you can flee still alive and quickly out of their reach too! and not be killed outright without a chance to be boarded and fight. 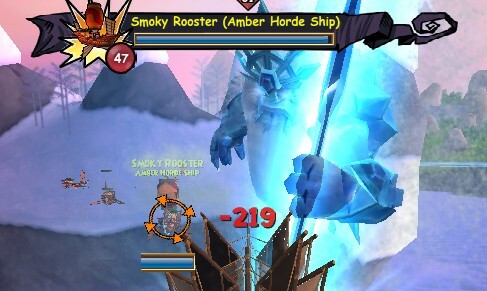 Honestly, I adore ship fighting. 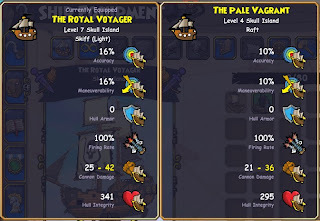 It's so much fun and you can gain fun nautical level badges! 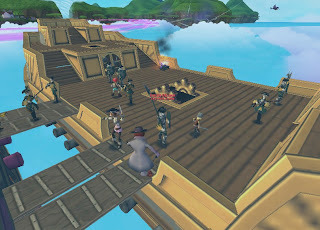 After getting your raft and frigate ships from quests, you will be on your own for a long time. So don't expect a free ship until the end of Cool Ranch. The best thing to do though is to save up gold for the next ship. My suggestion is to start with buying the Level 10 Frigate in Puerto Mico, Tradewind Skyway, Skull Island. It costs 16,000 gold. More if you want to dye it with expensive colors. Nautical Parts requires N.L. (Nautical Level) 8 at maximum. 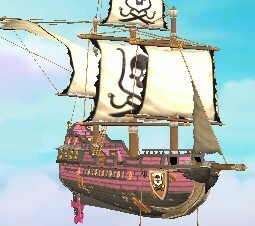 This is my pink Frigate LOL! 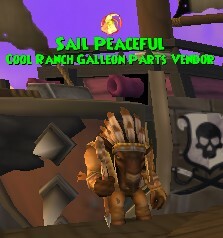 At the end of Cool Ranch, you do get a free Skiff ship. 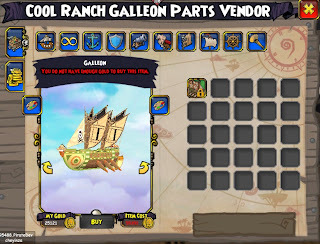 and get a nice Bison Galleon ship once you arrive in Cool Ranch. Or wait for the free Skiff ship once you're done with Cool Ranch. It's all up to you and how much you progress with your Nautical Level! than the BOUGHT ones. So you can earn XP and get free Ship Parts? WOW! But no you don't get them if you board them and fight. Okay, I think you got it all for now. Very informative post! I would highly recommend this to anyone who is just starting out...though that doesn't come as much of a surprise :p your posts and guides are ALWAYS extremely helpful and organized in a way that makes them easily accessible! THANK YOU! Your comment will be posted once it is approved. Thank you for sending a comment! 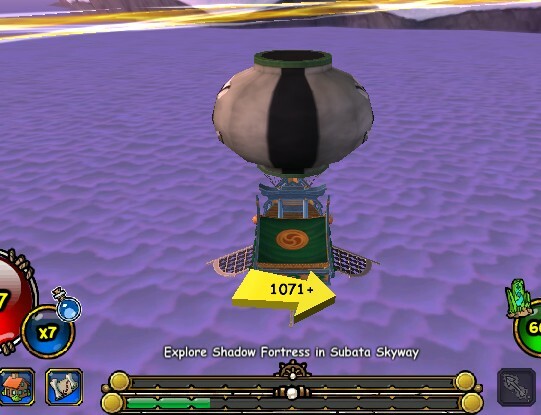 Have fun in the Spiral! Thank you Massively for mentioning my blog post about Captioning in the Game Industry! New Pets in Dr. Purreau's Pack! 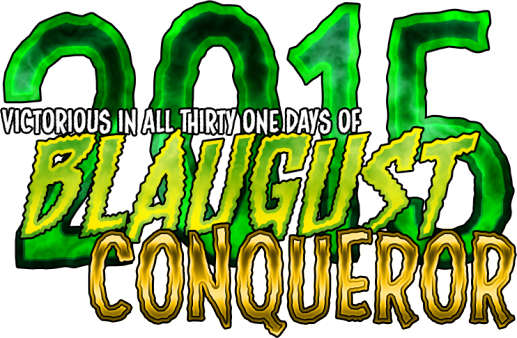 Contest Week for P101 & W101! Pirate101 Sends Out Closed Beta Keys!! 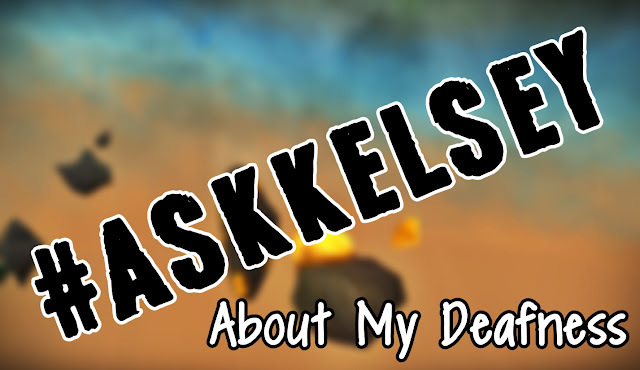 Hello, my name is Kelsey Fireheart. 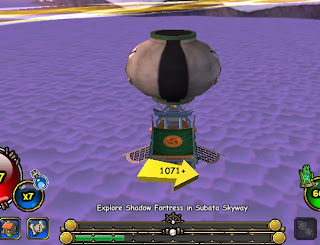 I created this blog on June 19th, 2010 for my site, StarsoftheSpiral.com which is an official fansite for Wizard101 and Pirate101. I'm here to blog about the games that I love. If you're here, you love them as well as I do! All W101 & P101 Images are Copyrighted by SotS, KingsIsle & Gameforge. Powered by Blogger.